Within the project the personnel was also increased, and solar collectors were installed as an innovative technical solution. After the successful implementation of the project, the range of services was increased and improved (organizing camps, events, extending the number of port services, carrying out trainings for each boat class), which enhances the development of Hungarian tourism by encouraging people who visit Balatonfüred and Lake Balaton to spend more and more time in this region. As a result of the implementations of this project, the 50 year-old big hangar was not demolished, but it was completed by an L shaped two-storey annexe (building B). In addition, a new sanitary unit (building C) was built next to the fence separating the territory of the Club from that of the Hotel Silver Resort. In the new building ’B’ a common room was created, where trainings, camp activities, professional events, and indoor trainings can be organized. The hangar and the store room are suitable for storing smaller boats and equipment of guests in the winter. Date of the implementation: 01.10.2013 – 30. 09. 2015. The project was funded by the European Union and the European Regional Development Fund. 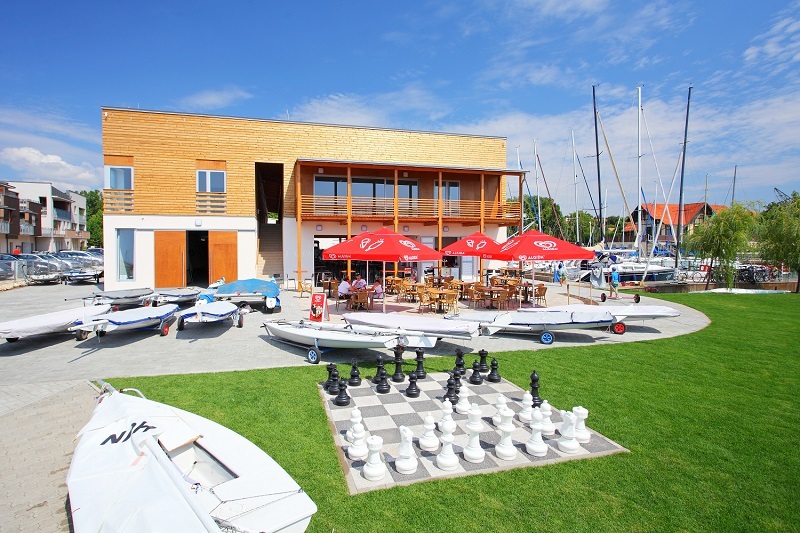 By implementing this project, the Balatonfüred Yacht Club carried out the modernization of its inner port in order to increase its capacity, which was an important part of the long-term plans of the Club, and also plays an important logistic role. The total cost of the developments was 82.9 million forints. The Club won 32.3 million forints at the tender. This development included the infrastructural improvement of the inner port, as well as improving its accessibility and increasing its capacity. As a result of the implementation of the project, due to the restructured and modernized division of the port, its capacity increased form 22 to 29 berths. In addition, two more berths were created for guests as well. A device suitable for lifting disabled people into their boats was also installed in the port, thus it improves the accessibility of the port for disabled people as well. Within the project further audiovisual and other forms of accessibility were implemented from our own resources. Due to the developments, the quality of our services was improved, and we also increased the number of our services. Waste water management services are also available on the shore, and there are electricity and water supply facilities as well. As a part of the project, the slipway and the boatyard of historical importance and the derrick next to them were also renovated. As a result of the project, the craning of ships weighing more than 4 tons is also possible now, and due to the developments the inner port is suitable for being a location of sailing competitions as well. During planning the port, we focused on using technical solutions, which have the least harmful impact on the environment, and we organized the operation of the port in accordance with the aspects of sustainable development. The project was implemented in the period between 29.10. 2010. and 31. 01. 2012.